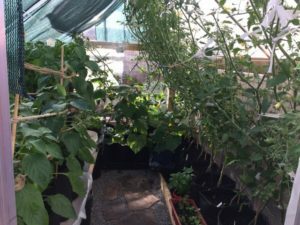 If you want to grow tomatoes, peppers, cucumbers, and sensitive herbs in the Bow Valley consider putting in a greenhouse. 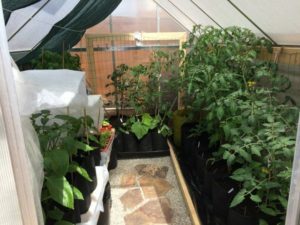 A trip to Hawaii in March of 2017 brought me home asking “what am I doing trying to grow tomatoes outdoors in this climate?” Within a week we had purchased online, a twin-wall polycarbonate greenhouse kit. Our cold nights here in the Bow Valley, set plants back in their growth (or downright kill them). A greenhouse with good heat storage keeps those plants warm at night, much warmer during the day and accelerates their production. Heat loving vegetables are so happy in a greenhouse and in return they give tasty tomatoes, bumper crops of basil, copious cukes, and plentiful peppers. 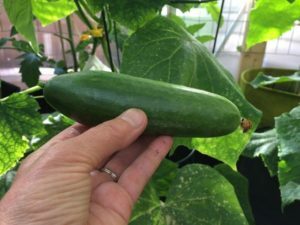 Greenhouse gardening also extends our short growing season by weeks in the spring and fall. For our 6 x 10 Palram Mythos greenhouse we dug down 4 to 6 inches, putting in a tamped gravel foundation with centre flagstone path. 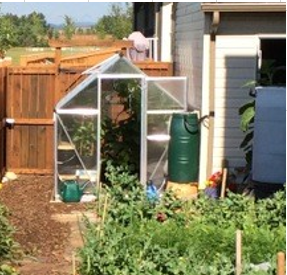 The greenhouse is attached to a 4 X 4 frame which is firmly anchored to the ground (because we live in a “Blow” Valley wind tunnel in Heartland). For heat storage we added pea gravel and black 5 gallon buckets filled with water. The buckets are shelf supports for the south side of the greenhouse. 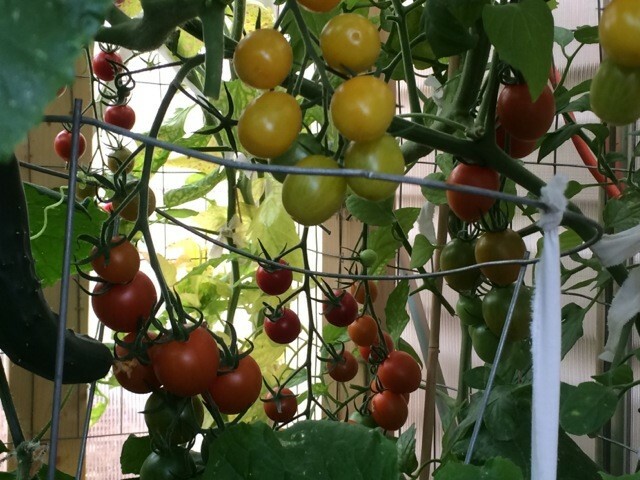 The north and west side are not shelved, allowing “indeterminate” tomato plants to reach the ceiling. 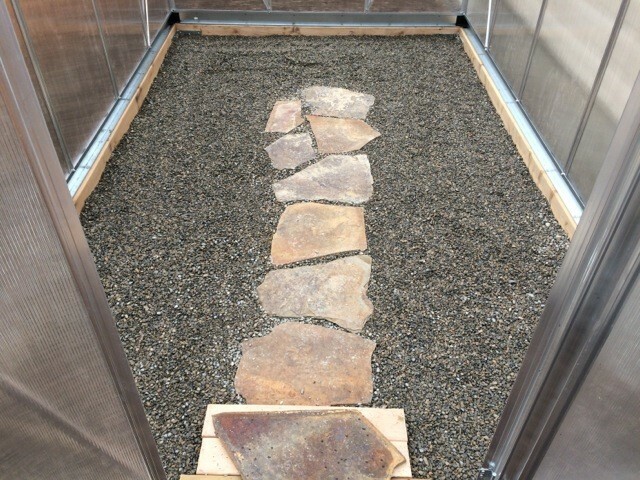 Rather than dig plants into the ground, we opted to plant in grow bags (homemade from 3.5oz weight landscape fabric). The bags sit in plastic lined trays which allows for watering by root absorption simply by filling the tray. The growing medium in the grow bags is a nutritious soil blend we put together made up of peat moss, sea soil, sheep manure, coconut coir and vermiculite. Regular feeding with worm castings and organic liquids keeps the plants happy. For seeds I chose short season (60 to 70 day) varieties and a range of tomato sizes. I started my tomatoes, basil and peppers mid-April indoors, cukes early May indoors, and moved them all out to the greenhouse starting May 18. We ate homemade pesto starting in June and tomatoes from late July into September. Yum!! Who knew that our biggest problem would be overheating? Clear Alberta skies and the hot days of summer 2017 meant keeping a close eye on temperature. Too much heat kills plants, so ventilation is critical to remove excess heat and moisture. The greenhouse came with one roof vent and full size door to which we added a fan and shade cloth. This year we will add a gable vent to help move the hot air through.